Brigadier General David Sarnoff's name was well known to most people in the realm of communications up to the time of his death in 1971. His technical and leadership skills were recognized and rewarded throughout his very accomplished lifetime in both military and civilian venues. 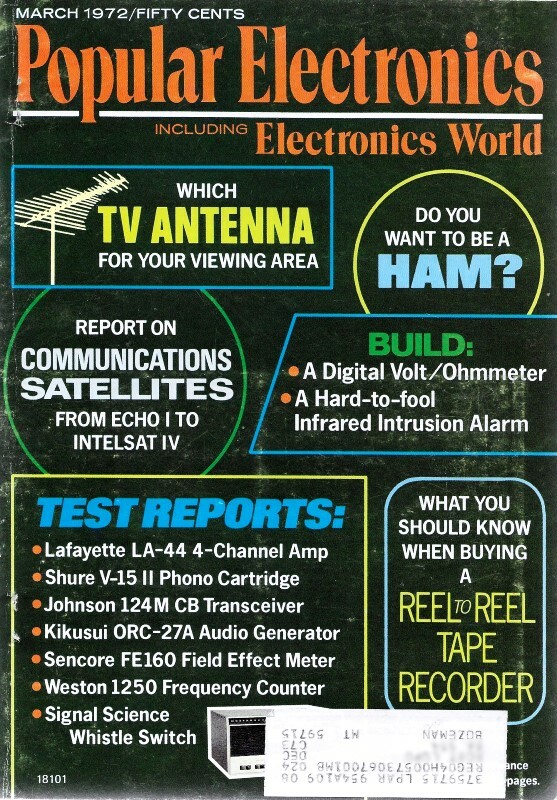 This brief biography of Sarnoff was printed in the March 1972 issue of Popular Electronics magazine. As with many people of high acclaim, he had a few run-ins with other notable people during his career - the most famous of which was the Battle of the Airwaves fought between Edwin Armstrong and him over FM versus AM broadcasting. See my piece titled, "Edwin H. Armstrong: The Rest of the Story." The death of David Sarnoff marks end of an era of remarkable innovators and daring developers who made today's sophisticated communications systems a reality within a single generation. The passing of Brig. Gen. David Sarnoff, former Chairman of the Board of RCA, on Dec. 12, 1971, brought to a close an era in which men who head giant U.S. corporations were as well-known to the man in the street as to their fellow board members. David Sarnoff's public career with Radio Corporation of America (now RCA) began in 1930 when, at the age of 39, he was elected president. In 1947, he was named Chairman of the Board and Chief Executive Officer. He relinquished the post of Chief Executive Officer in 1966 on his 60th anniversary of service in the fields of communications and electronics. Born on February 27, 1891 in a small village near Minsk in Russia, Mr. Sarnoff came to the U.S. in 1900. 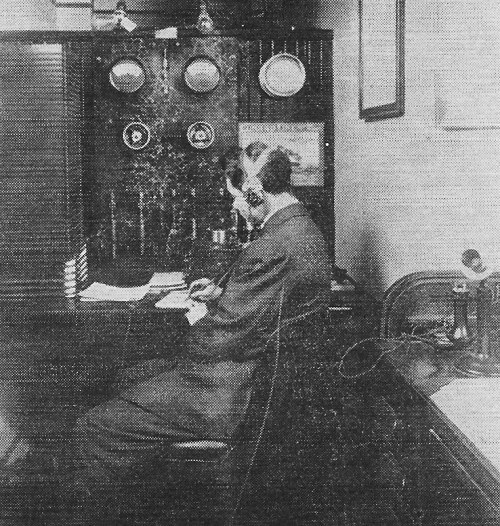 In 1906, he went to work as an office boy with the Marconi Wireless Telegraph Company of America. At 17, he became an operator at the Marconi wireless station at Saisconset on Nantucket Island. When he later became the Marconi station operator atop Wanamaker's store in New York, he attended evening engineering courses at Pratt Institute. At radio station atop New York store, Sarnoff, on duty for 72 hours, reported sinking of Titanic to the world. 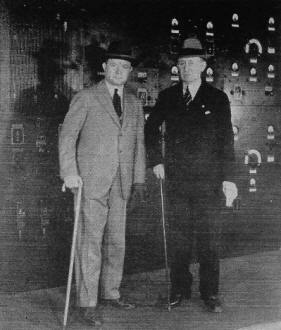 David Sarnoff and Guglielmo Marconi in a photograph taken in 1933 at the RCA transmitting center located in the town of Riverhead, Long Island. In 1939, Sarnoff dedicated the RCA pavilion at the New York World's Fair. 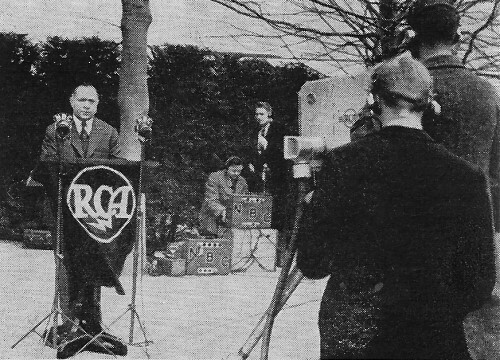 It was the first time a news event was ever covered by television. While on duty the fateful night of April 14, 1912, young Sarnoff picked up the message reporting the Titanic's distress signal and subsequent sinking. He stayed on duty continuously for 72 hours, relaying messages from the rescue ship to the anxious world. With experience in military radio dating back to WWI, when he played an important role in helping to equip the American forces with wireless, he was appointed a Lieutenant Colonel in the U.S. Army in December 11, 1924. During WWII, he served in the office of the Chief Signal Officer in Washington, D.C. In 1944, he went overseas to serve as Special Consultant on Communications to General of the Army Dwight D. Eisenhower at SHAEF in Europe. 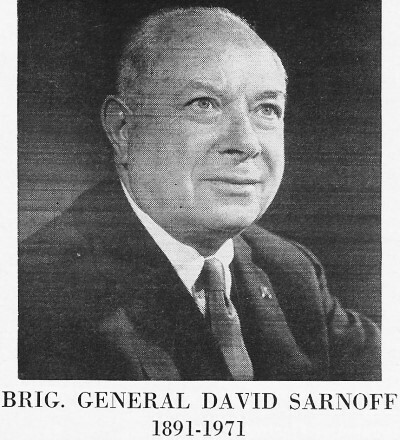 Mr. Sarnoff was promoted to Brigadier General in 1944. Although he was an innovator in many fields, Mr. Sarnoff is probably best known for his efforts in making good music available to the vast listening audience. He arranged for Dr. Walter Damrosch to conduct the weekly "Music Appreciation Hour" for schools throughout America, the broadcasting of the Metropolitan Opera to music lovers from coast to coast, and, in 1937, the creation of the NBC Symphony Orchestra for Maestro Arturo Toscanini, which continued under the Maestro's baton until his retirement in 1954. Mr. Sarnoff was always in the forefront of developments in radio broadcasting, black-and-white TV, and all-electronic compatible color television. At his instigation, the David Sarnoff Research Center, Princeton, N.J. developed a wide range of electronic equipment not only for consumer and commercial uses, but also for space applications. Mr. Sarnoff was the recipient of innumerable awards and honorary degrees from grateful governments and groups around the world. He served as president of a number of associations and was granted honorary memberships in an impressive list of learned societies, who thus acknowledged his many contributions in electronics - particularly in the field of communications. On his 60th anniversary in communications and electronics, more than 1500 industry leaders and outstanding citizens gathered at the Waldorf-Astoria in a "Salute to David Sarnoff" sponsored by the Electronic Industries Association, the Institute of Electrical and Electronic Engineers, and the National Association of Broadcasters. During the unprecedented event, tributes were paid to Mr. Sarnoff not only by industry leaders but by heads of state, governors, mayors, diplomats, cabinet officers, Supreme Court justices, as well as former Presidents Truman and Eisenhower. General Sarnoff is survived by his wife of 52 years, three sons, and nine grandchildren. His eldest son, Robert, succeeded his father as Chairman of the Board of RCA. The electronics industry is today poorer for the loss of David Sarnoff - one of its colorful pioneers and industry leaders for more than a half century. We join with the rest of the industry in mourning his passing and extend to his family and fellow workers our sincerest sympathy.